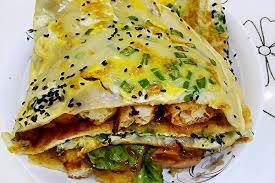 煎饼果子, Jian Bing Guo Zi (meaning “pancake roll”), is a savoury street food said to have originated in the northern city of Tianjin. During the Ming and Qing eras, Tianjin was a major centre of commerce and drew people from all over the country. Incoporated in the art of the Jianbing is that of the Shandong pancake, the Zhejiang You Tiao (fried dough sticks), with a daintier variation of the dish from Eastern China. Unlike Western pancakes, the batter for Jianbing is mainly made from mung beans, and can occasionally have a little millet, corn or wheat mixed in. The secret to the delicious taste of traditional Jian bing is that the liquid used to mixed the batter, is meat broth, most commonly lamb. Jianbing Guozi stalls are dotted around many cities of north China, usually offered by vendors on the sides of busy streets, wherever there is a convenient resting place for pedestrians and enough space to shelter a small stove and a flat frying pan – the back of a bicycle, a window in the wall, or a simple stand. I first tasted it during my first trip to Beijing in the late 1980s. It’s popularly eaten for breakfast or a light snack during the day, its warmth perfect for cold northern winters and its taste combining the flavours of an entire meal in one. My English partner first tasted the dish on his first trip to China in 2004. Later when we were studying in Beijing, it became one of his favourite treats. He loves it even more than I do. Nowadays, you’ll find Jian Bing Guo Zi in cities all over China, as far south as Guangzhou. Recently in London’s Chinatown, food stalls that have started to offer skewered snacks have also started to sell these morerish pancakes. I wouldn’t be surprised to find that it has made its way elsewhere around the globe (I’d love to hear about it from you). If you’re in New York, do check out Mr Bing‘s fantastic looking store.